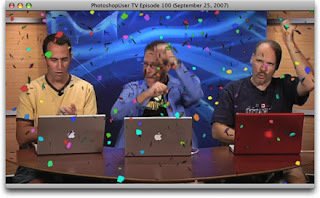 Scott Kelby, Dave Cross, and Matt Kloskowski, aka "The Photoshop Guys", celebrated their 100th episode of Photoshop User TV (formerly known as Photoshop TV) today. I look forward to Tuesday of every week to download the latest episode of Photoshop User TV via my iTune (Gosh, I'm such a geek!). I have all 100 episodes. (OK, I'm really a big geek!) They have gone a long way since the first episode. They started taping in Scott's office and now they have their own recording studio with studio lighting and quality sound. The show is filled with Photoshop Tips and Tutorials. I've learned so much from these guys for the past 2 years. Besdies they are hilarious together, especially the memorable "Steam" episode. For those of you who are avid viewers of this show, you'd know what I'm referring to. Anyhoo... Happy 100th Photoshop User TV!